Convert us, O God our Savior, and instruct our minds by heavenly teaching, that we may benefit from the works of Lent. Through our Lord Jesus Christ, your Son, who lives and reigns with you in the unity of the Holy Spirit, one God, for ever and ever. The History of the Latin Vulgate | John E. Steinmeuller D.D., S.Scr.L. Historically today is the feast of the martyred priest, St. Eulogius of Cordoba, Spain, who was slain by the Moors. A noted scholar of Scripture, Eulogius was arrested in 850 after writing Exhortation of Martyrdom for two young virgin martyrs, Flora and Mary, who were beheaded after refusing to abjure the faith. Released after a time Eulogius ws named archbishop of Cordoba or Toledo. Before he could be consecrated, he aided Leocritia, a young Moorish woman who had converted to Christianity. They were caught and beheaded. Eulogius also wrote The Memorial of the Saints and an Apologia. It is also historically the feast of St. Sophronius a simple monk who pursued a life of prayer and sacrifice first in the desert of Egypt, then near the Jordan River, then finally in the Holy City of Jerusalem. He was ultimately chosen to be bishop and Patriarch of Jerusalem in the early 7th century. He valiantly defended the true and full humanity of Christ in the face of the heresy of Monothelitism, which denied that Jesus had a human as well as a divine will. The year before his death in 638, he witnessed the capture of Jerusalem by the Muslims under the Caliph Omar. Several of his sermons and poems have survived till this day. St. Sophronius is known as one of the Fathers of the Church. St. Eulogius was of a senatorian family of Cordova, at that time the capital of the Moors in Spain. Our Saint was educated among the clergy of the Church of St. Zoilus, a martyr who suffered with nineteen others under Diocletian. Here he distinguished himself, by his virtue and learning, and, being made priest, was placed at the head of the chief ecclesiastical school at Cordova. He joined assiduous watching, fasting, and prayer to his studies, and his humility, mildness, and charity gained him the affection and respect of every one. The Archbishop of Toledo dying in 858. St. Eulogius was elected to succeed him; but there was some obstacle that hindered him from being consecrated, though he did not outlive his election two months. A virgin, by name Leocritia, of a noble family among the Moors, had been instructed from her infancy in the Christian religion by one of her relatives, and privately baptized. Her father and mother used her very ill, and scourged her day and night to compel her to renounce the Faith. Having made her condition known to St. Eulogius and his sister Anulona, intimating that she desired to go where she might freely exercise her religion, they secretly procured her the means of getting away, and concealed her for some time among faithful friends. But the matter was at length discovered, and they were all brought before the cadi, who threatened to have Eulogius scourged to death. The Saint told him that his torments would be of no avail, for he would never change his religion. Whereupon the cadi gave orders that he should be carried to the palace and be presented before the king's council. Eulogius began boldly to propose the truths of the Gospel to them. But, to prevent their hearing him, the council condemned him immediately to lose his head. As they were leading him to execution, one of the guards gave him a blow on the face, for having spoken against Mahomet; he turned the other cheek, and patiently received a second. He received the stroke of death with great cheerfulness, on the 11th of March, 859. 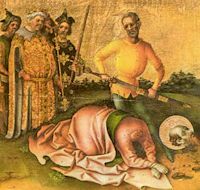 St. Leocritia was beheaded four days after him, and her body thrown into the river Guadalquivir, but taken out by the Christians. Patriarch St. Sophronius of Jerusalem was called the Sophist because of his knowledge of Greek. He was an ardent opponent of monothelitism. Many of his writings, including the Florilegium and the Life of St. John the Almsgiver, are no longer extant. He wrote an encomium on John of Cyrus and composed 23 anacreontic odes on the feasts of the church. His Christmas homily of 634 suggests that the Saracens held Bethlehem at that time. (Historians had dated the event later). The Orthodox remember St. Sophronius chiefly as the author of the life of St. Mary of Egypt. Sophronius was born in Damascus around 560. He and his friend John Moschus became ascetics together while they were in their late teens or early twenties. Some say they lived near the Jordan; some say they lived in Egypt. In 605, Sophronius fled to Alexandria in the wake of Persian invaders, and when the Persians invaded Alexandria in 616, he fled to Rome. In 619, he returned to Palestine and lived in the Theodosius monastery in Jerusalem. When Patriarch Cyrus of Alexandria began to preach monothelitism, St. Sophronius traveled to that city to argue against him; in 633, when Patriarch Sergius of Constantinople began to preach monothelitism, St. Sophronius traveled to that city to argue against him. Neither visit was successful. After Sophronius was elected Patriarch of Jerusalem in 634, he wrote the Synodical Letter to teach the two wills of Christ. In 637, the Muslims captured Jerusalem; St. Sophronius died a year later of grief at the fall of his city. 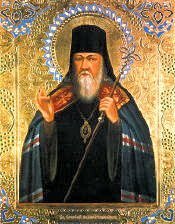 Read more about this Father of the Church at: The St. Pachomius Library, St. Sophronius of Jerusalem, St. Sophronius, Patriarch of Jerusalem, St. Sophronius and Butler’s Lives of the Saints—Saint Sophronius, Patriarch of Jerusalem, Confessor. This church was one of the tituli, Rome's first parish churches, known as the Titulus Eudoxiae or the Eudoxiana. It was built over the ruins of an Imperial villa in 442 (or possibly 439), to house the chains that had bound St. Peter in prison in Jerusalem.